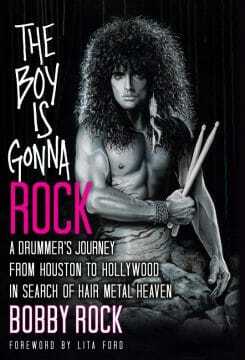 FOR THOSE WHO HAVE READ MY RECENT INTERVIEW WITH FORMER VINNIE VINCENT INVASION DRUMMER BOBBY ROCK (PARTS 1 AND 2), IT WAS OBVIOUS THAT THERE WOULD BE AN EXTENSION TO BOBBY ROCK’S STORY. WHEN INTERVIEWING AN ARTIST, THERE ALWAYS SEEMS TO BE ANOTHER NAME MENTIONED WITHIN. THAT’S WHAT DROVE ME TO THIS NEXT INTERVIEW. WHEN IT COMES TO THE ART OF MUSIC, THERE ALWAYS SEEMS TO BE OTHERS INVOLVED. THOSE THAT ARE INTERTWINED WITHIN SOMEONE ELSE’S STORY AND VICE VERSA. JOHN DOUGLAS WAS A NAME THAT WAS MENTIONED WITHIN BOBBY ROCK’S STORY. DOUGLAS REALLY INTRIGUED ME. THIS WAS A MAN I WAS FAMILIAR WITH FROM HIS DAYS DRUMMING FOR THE BAND KIK TRACEE, BUT THERE IS MUCH MORE TO HIS STORY THAN THAT. JOHN DOUGLAS IS A SUPER TALENTED DRUMMER — YES, BUT HE IS ALSO A SUPER TALENTED ARTIST. 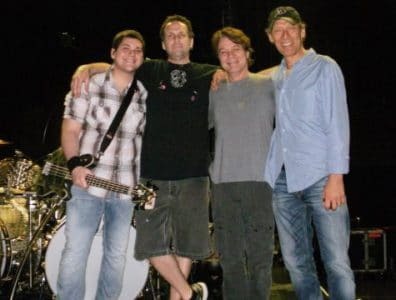 HE HAS WORKED WITH SOME OF ROCK’S FINEST MUSICIANS. HAVE YOU EVER LOOKED AT AT DRUM KIT OR A GUITAR AND WONDERED WHO WAS THE ARTIST BEHIND THAT GREAT PIECE OF WORK? GIVING AWAY TOO MUCH, MY HOPE IT THAT THIS STORY WILL INTRIGUE YOU, AS IT DID ME. IT’S A VERY IN DEPTH ACCOUNT OF A MAN WHO REALLY PLAYS A MAJOR ROLE IN THE DESIGNING SOME OF THE MOST AMAZING ARTISTICALLY VISUAL PIECES OF MUSICAL ART IN THE LAST THIRTY YEARS. 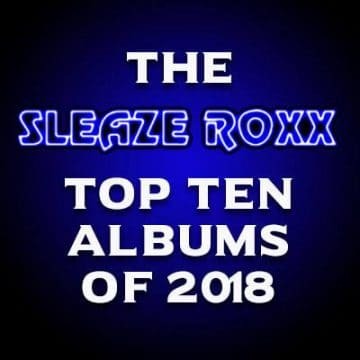 NOT ONLY DO I THANK JOHNNY DOUGLAS FOR A GREAT INTERVIEW, BUT I THANK JOHNNY AS WELL FOR PROVIDING SLEAZE ROXX WITH SOME VERY COOL PHOTOS FROM HIS OWN PERSONAL COLLECTION. BEFORE WE GET INTO THE MEAT AND POTATOES OF THIS INTERVIEW, I MUST ASK THAT YOU PONDER THE POSSIBILITY THAT THERE MAY BE MORE TO THIS STORY IN THE NEAR FUTURE. MAYBE NOT FROM DOUGLAS’ PERSPECTIVE, BUT FROM OTHERS THAT PLAY INTO THE EQUATION. PLEASE READ CLOSELY AND THINK TO YOURSELF WHAT COULD POSSIBLY BE ON THE HORIZON. FOR ME, IT’S LOOKING AHEAD AND OPENING UP THE POSSIBILITIES. SEEING THINGS ON A WIDER SPECTRUM. READ INTO THAT AS YOU MAY, BUT FOR NOW, LET’S FOCUS ON JOHN DOUGLAS!!! 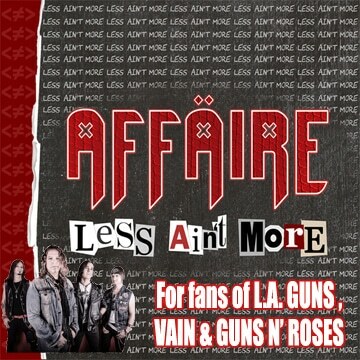 Sleaze Roxx: Hey JD, great talking to you. What do you prefer — JD, John or Johnny as you were called in Kik Tracee? Johnny Douglas: My name is John Douglas. That’s what I call myself. That’s how I sign my paintings, etc. Many people still call me Johnny — and obviously that was how I was listed on all the Kik Tracee material. That’s fine too. And many people call me JD — it’s an obvious nickname that most of my touring friends call me because there are usually a few “John’s” on every tour. So I answer to all three. Sleaze Roxx: Thank you for the clarification. I will start by asking a question that relates to a subject that can be found on your website. It states you are a “Recovering drummer.” There is somewhat of an explanation in regards to that term on the website, but I’d like to hear your explanation? Johnny Douglas: [Laughs] I was just trying to be funny. Basically, since Kik Tracee really, I stopped pursuing that. I still play. It will always be my first love. That’s where the recovery part came from. I should say “Failed recovering drummer”! It is an addiction — albeit a beautiful addiction. I really stopped pursuing drumming as a career like I did when I was younger. 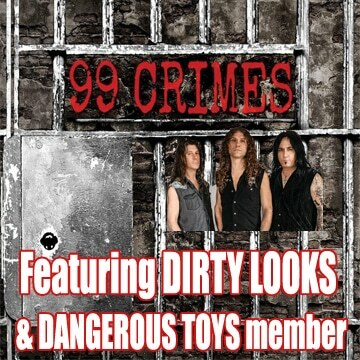 Sleaze Roxx: As you know, I recently conducted an interview with Bobby Rock about his new book. Your name came up as the painter of the book cover. What was your approach going into that cover? I am sure Bobby had a vision that he wanted you to emulate, knowing from speaking with him that a portion of that idea came from a photo session he did with the Vinnie Vincent Invasion. Johnny Douglas: Yeah, he really wanted to capture that time frame. Obviously, he wanted that over the top, glam, ’80s hair metal, all those clichés, in addition to his over the top muscle persona, which is who he is and he’s passionate about that. I noticed somewhere, where the cover was posted on social media. Somebody commented about it. Something to the effect of, “Kind of a ridiculous photo shop thing!” On one hand I guess it’s flattering as an artist where somebody would think it’s a photo, but it’s not. I really didn’t take any artistic license on his physique. That’s for real. The hair and the muscles are all real. Sleaze Roxx: If you know of him from ’86 on, that’s what he looks like. Johnny Douglas: Well I’ve known him since 1979-80. So basically, the perfect image really didn’t exist. So I had to combine different things. Certainly the elements of his outfit from the back of the first album cover, with the body paint and that whole marble thing, combined with another still photo with a feather earring. Those elements, he wanted included that didn’t really exist on one single photograph. So I had to combine these elements into a painting. That was it. On a ridiculous time schedule too because he needed it really quickly, so that was the hard part. Sleaze Roxx: That was actually one of the first questions I initially asked him. I read the book. The book’s amazing. The cover itself was kind of intriguing to me. I myself initially thought it wasn’t a painting. My initial question was, “Was that taken from that original photo session?” Of course right off the bat he says, “No, that’s a painting!” Then he mentioned your name. So anyways, job well done! Sleaze Roxx: So Bobby had also mentioned you being a painter/designer of drums kits. More or less, he said anything that has been designed or painted, you are pretty much the guy who does it. How did you initially get into that? Johnny Douglas: Well again, music, more specifically drumming and art have always been my passions. With music trumping everything, that kind of goes back to the “Recovering drummer” deal! That will always be the pinnacle of the passion, but I’ve always done art too. When you’re in a band, there’s typically always that situation where somebody has to design the logo, somebody has to design flyers or maybe paint a backdrop. There is art direction involved in being a band. I’ve done that in every band I’ve been in. So it got to the point where, in the quest of trying to make my drums look cool, I started refinishing them. Painting the kick drum heads with logos or artwork. Then when I got the courage up to actually paint the drum shell, I started painting those. It was all in an effort to make my drums look different with unique setups and artwork on the drums themselves. It even started doing that well before Kik Tracee. There was a band here in Houston called XOX that I was in. That’s when I started painting my drum kits and having elaborate set ups. This was mid to late ’80s. It was all about double kick and what not. So it was just me wanting my drums to look cool and stand out. The band got very popular in Houston to where the guys from ZZ Top, who lived here in Houston, would come see the band play. Eventually I met them. I met drummer Frank Beard. He commented on my drum kit. He asked who painted it. I said, “I did!” “Will you paint a drum kit for me?” That’s how it started. Basically quite by accident! I never really considered doing it for anybody else. It was all about my drums, my band and looking cool! That’s how I started painting and designing drum kits for other people. Then it was just word of mouth. 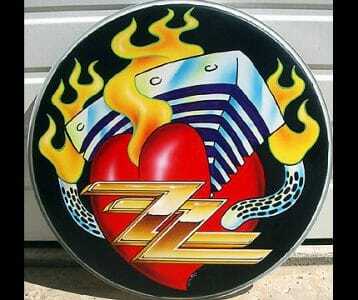 ZZ Top. I mean this was ’86 or ’87. They were a huge band. I paint drums for Frank, then another drummer sees it. You know, “Who paints your drums? Those are cool!” That’s how it started. 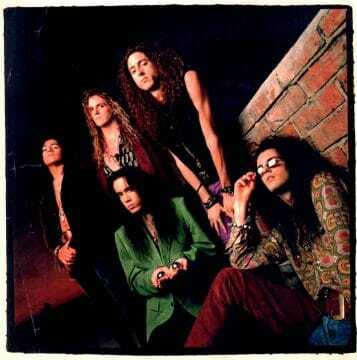 Sleaze Roxx: It kind of snowballed from there? Johnny Douglas: Even when I was in Kik Tracee… As for that band in Houston, we just couldn’t get a record deal. Finally, we broke up. The Kik Tracee thing came in. Even when I was touring with Kik Tracee, I was painting drums for other people. On tour, literally in my hotel rooms after our shows. I would be painting drums for other people. Roxx: As I get to Alex Van Halen, as Bobby mentioned your name, I automatically said, “Oh, Johnny Douglas, that’s the guy in a Kik Tracee Metal Edge segment.” The article showed a picture of you holding up a ‘For Unlawful Carnal Knowledge’ drum head. What was that ’91, ’92? Johnny Douglas: Yeah, probably something like that. 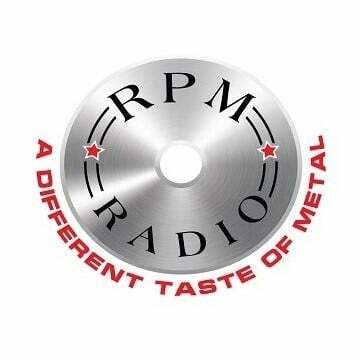 Sleaze Roxx: I guess Alex Van Halen came word of mouth as well? Johnny Douglas: Yeah, before Kik Tracee, I was back here in Houston. 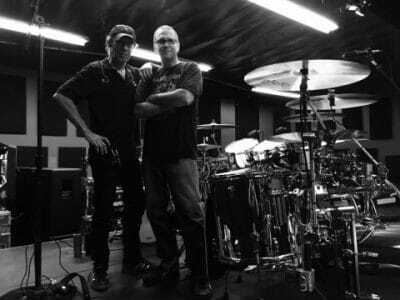 I met Alex’s drum tech at the time, a guy named Rob Kern. I painted some stuff for Alex before Kik Tracee. When I got in Kik Tracee, he called me again to do those drum heads that you were talking about for the ‘Carnal Knowledge’ tour. So I initially met his drum tech. He knew what I was doing for other people and that got me in the Van Halen camp. 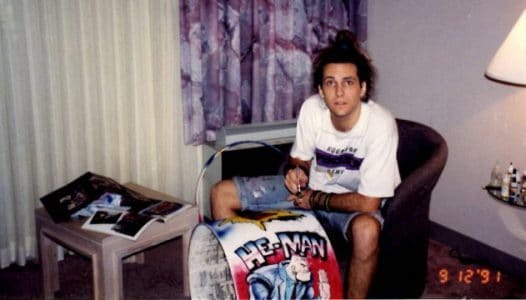 Sleaze Roxx: The drum head that you painted? It kind of emulated the album cover somewhat? Johnny Douglas: Yeah… And he didn’t end up using it [laughs]. It totally crushed me being a huge Alex Van Halen fan. Just to have that opportunity. They asked me to paint the cover. I went and painted it. A week later, I bring it down to rehearsal. We put it on the drum kit and we walk to the back of the room. Alex looks at it and goes, “Yeah… No! That’s not it.” I was like, “Uhhuh!! !” Totally crushed. Then he says, but he was cool, “I thought you did a good job. Now that I see it up there, it’s just not what I want.” Then he says, “How about this? How about you paint a picture of a hand holding that VH logo? Like a comic book hand holding this kind of chromish Van Halen logo on the drum head!” “Okay, I’ll try that!” I went with that. I did the best I could with it. I bring it back a week later. We do the same thing. We put it on . We walk to the back of the room, he looks at it and goes, “Nah, that’s not it!” I’m just thinking, “Hhhuuhh!” Totally deflated again and crushed. Here’s my idol and he doesn’t like what I painted. He says, “That’s what I asked for and you did a good job. It’s just now that I see it. It’s not what I want either!” I said, “Okay!” Now, this was the F.U.C.K. tour. If you’re a drummer geek like I am, you know that was the only time that Alex Van Halen used a single kick drum, as opposed to two, four or six drums. 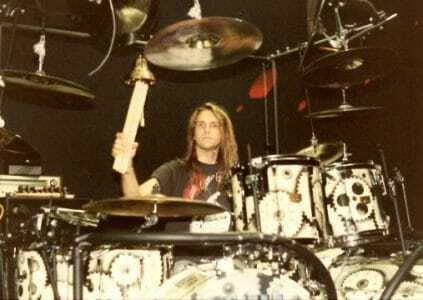 It was a relatively very scaled down drum kit on the Van Halen scale of things. So he looks at me and says, “What do you suggest? What would you do?” “I’d just have a black drum head on there! It’s a chrome kit. There’s only one up there.” It was relatively small compared to what he usually uses, which is 26’s now. This was a 22 or a 24. Just one bass drum. So I said, “Just have a black drumhead on there!” He goes, “I like it. Okay.” So that’s what he did and what he went with, but he still paid me for the two drum heads that I painted. Obviously that started our relationship and I still work for him today. At the time though, I was crushed. 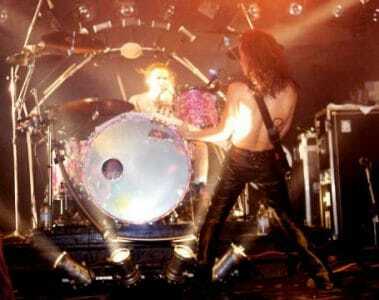 Sleaze Roxx: Does he have those drum heads or do you have them? Johnny Douglas: He gave them to me. He paid for them and I got to keep ‘em. Sleaze Roxx: You’ve done some guitars as well? Johnny Douglas: Yeah, I did guitars. Once I learned how to do the clear coat process. With painting a drum, the artwork is easy. 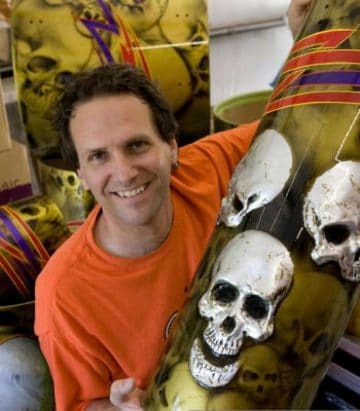 I am an artist that learned how to refinish drums and guitars as opposed to a lot of people who are car painters that learn how to paint drums or guitars. So they’re just using automotive paint. So once I learned what materials to use, how to use them and buy the right guns, masks, buffing etc. Once I learned how to do that, I was set. Honestly, guitars are easy. I’ve painted everything. Golf clubs, surf , scuba tanks, etc. If paint sticks to it — I’ve painted it! Now because of the music career, obviously drums were my main thing. In the ’80s, every guitar company had in-house artists due to the fact that the graphics on the guitars were very popular. I didn’t do a lot of guitars because there were already a lot of guys doing them. I guess there just weren’t a lot of guys doing drum kits. The drums are a way bigger job. As a drummer, I like to think that I understood what it took. It’s a different canvas to paint something to where it works on a drum kit. A guitar is easy. It’s just the front of a guitar. I was also with the art department for the Peavey Wolfgang Custom Shop. They would ship me prepped bodies and necks. I did the artwork, then sent it back to the factory for finish and assembly. I did that for the entire duration of the Custom Shop. Sleaze Roxx: The guitar that you did that comes to mind for me is the Joe Perry guitar with the portrait of what I believe was his wife right? Johnny Douglas: That’s right! ‘Billie’! Yeah! That came about… If you’d like to hear that story! Johnny Douglas: That was the first time I started working for ZZ Top. I was teching, which was after Kik Tracee imploded. I went home, trying to figure what I was going to do. Anyways, I started working for ZZ. This was 1994. ZZ Top went to New York. They played a song on David Letterman. 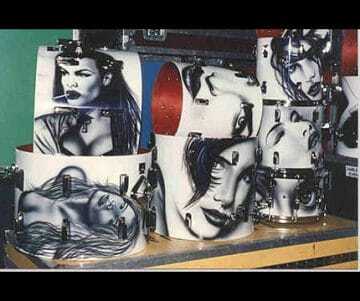 I had, at that time painted a drum kit for Frank [Beard] that was all black and white portraits. We called it “The Super Model Kit.” Basically, I went through magazines. Fashion magazines and tore out pictures of beautiful women in cool poses. 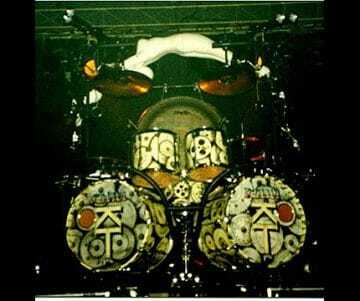 I painted them all over his drum kit. Faces of pretty girls in black and white because I loved that format. Here is ZZ Top on Letterman with that drum kit. It just so happened guesting on Letterman — back then Letterman would have guest musicians — was Joe Perry sitting in with Paul Schaffer and the band all week. His guitar tech, Jim Survis, commented on the drum kit. We strike up a conversation and that’s that. This was January of 1994. 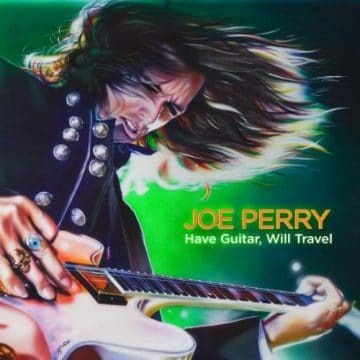 Six or seven years later, somehow Joe Perry says, “I want a portrait of my wife painted on the guitar!” He’s telling Jim his guitar tech that and Jim goes, “I know the guy!” He remembered me from six or seven years earlier and somehow he tracked me down. I don’t remember how. I guess there was internet then, but I don’t know how he did it. He tracked me down and that’s how that relationship started. I talked to Joe. We batted around ideas. That’s probably the most famous guitar that I’ve done. He still uses it to this day. It’s been on Super Bowls and every magazine cover. I am sure photographers are sick of it because they’ve seen it a million times. He loves it. Joe and his wife are still together. It’s a good sounding guitar. Sleaze Roxx: I believe it made its way into his book as well! Johnny Douglas: Yes, it is in the book. Then I did a painting which ended up as the cover of one of his solo albums, which happened again by accident! I always thought it would be cool for me to paint a picture of Joe Perry playing the guitar that I painted for him. I just thought it would be a cool thing for me. So I did that. I had some time off and started painting this great big painting. When I talk about great big, it’s six feet wide by four feet tall. It’s colorful and full of life. A painting of Joe playing the ‘Billie’ guitar! I finished it. At that point, Joe’s guitar tech, Jim Survis, was a friend of mine. By then, we had known each other for a lot of years. I called up Jim and said, “Hey man, I did this painting and I’d like you to get Joe to sign it for me!” He says, “Yeah, I’m just up at Joe’s house right now. He’s working on a solo album. Fed Ex it up to me, I’ll show it to him and get him to sign it. No problem!” I rolled it up and Fed Ex’d it to him. They got it, hung it on the wall in the studio, Joe walks in and goes, “That’s great! I wanna use that for my album cover!” So he did. It wasn’t intended. I didn’t even know he was working on a solo album. So it was just a weird coincidence. 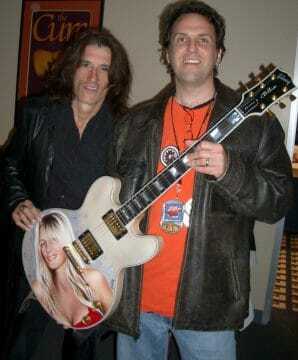 A timing thing that leads to having a long history with Joe Perry. I’m more known for being the drum guy, and I’ve painted quite a few guitars, but that’s definitely the most iconic guitar that I’ve done. Sleaze Roxx: Getting a little more in depth into the drum thing, I am curious about the actual process. How would you go about actually painting a drum? A tom drum for instance. Would you have a special type of vice that you would use? Something that while you’re painting it, it doesn’t move. Johnny Douglas: Over the years, because I’ve done it a lot, I’ve developed my system. Basically I’ve kind of built different apparatus to accommodate what I do. A lot of it depends on what the artwork is. Let’s say if I had a drum, I set it a certain way. I have work benches, but I also have two pipes that I slide the drum shell onto. With all the drum heads and the hardware off, there’s the shell that I place over the pipes that are wrapped in foam. The drum doesn’t move, so I can paint it flat and just rotate the drum on the pipe as I’m working on it. I could have it on a lazy-susan where I just spin it, as I paint it. That’s for the artwork itself. The clear coating, the sanding and the buffing, that’s a whole different process. Surprisingly, there is a large amount of surface area when you get into multiple kick drums. A guitar is nothing versus even a snare drum. That is the smallest drum of the kit. That’s as far as the surface area that you have to cover. It’s a curved surface where that could be tricky especially if you’re painting someone’s face. There are a few obstacles that you always have to consider. Where the hardware is going to land? Then you’re thinking, “How is the guy going to set it up?” It’s got to make sense. You strip it down. You paint it one drum at a time, but you’ve got to visualize it set up. There are multiple challenges that you have to keep in mind. Sleaze Roxx: When you first started doing the customized painting, did you mess up a lot of kits? Johnny Douglas: [Laughs]…. I think the hardest part was learning how to do the finish work. Certainly, the first few drum kits, the actual finish, meaning the gloss, the shine, the clear coating is not up to par. It wasn’t as good as a factory finish. Again, I came from the artwork side. I had to learn how to do the finish part. Still to this day, I feel like the artwork is the easy part. I feel like, “I’ll give you artwork but I’ve got to charge for all the work, the clear coating, prepping, sanding, buffing and polishing.” That’s the labor intensive portion in there, the expensive materials. I think there are certainly some kits that conceptually that came out better than others. It’s like anything, artistic wise, if you’re a musician, artist, poet or an actor. Hopefully you get better with every job, album, movie, poem, etc. Whatever it is, you progress. To answer your question, when I look back at early paint for a guitar or drum — if Joe Perry came to me today to do the portrait of his wife, although I’m still proud of that one, I know I could do better. Definitely, drum wise, there’s ones that I look back on and I say, “Yeah, I could definitely do a lot better!” That’s life! With the drums, sometimes when I start, very rarely do I do any sketches or anything. When I jump in, I start laying the paint on the drum. It kind of takes on a life of its own. When you enter from the two dimensional world of a sketch or an idea in your brain, to where you start putting it in the real world on a drum, it’s very different. It becomes something different than that of what you initially anticipated. It’s a process. Sleaze Roxx: You did do your kits in Kik Tracee? Do you still have those kits? Johnny Douglas: No! I know where they are. Well, I know where one of them is. I kept the snare drum, I can’t keep everything. When I look back, I say, “I wish I had a lot of what I had when I was a kid!” They’d be valuable now. I wish I still had the Schwinn Pea Picker muscle bike from the ’70s that is very valuable now. You can’t keep everything. As for drum kits, I can’t tell you how many I’ve had in my life. That’s kind of the downside of customizing. If you have just a stock drum kit, lacquer, chrome etc., you could use it forever, but when you start customizing, especially to the extreme that I do. Did do, or still do, really only good for one tour. It’s got a theme, it’s over the top, the custom paint, etc. You burn out on it. There’s no way I could keep every drum kit. I already have too many drums as it is in my shop, but those Kik Tracee kits, I don’t have.